NEW YORK, Jan. 22, 2019 /PRNewswire/ -- The European Table Olives Campaign, brought by P.E.M.E.T.E., continues the promotion of European Olives in the United Arab Emirates by implementing their second year of actions with the goal of strengthening its image in the United Arab Emirates market. The following promotional campaign launches in January 2019. The van will be driving around the city for three weeks/eight hours per day in Dubai and will "support" the rest of the actions of the campaign throughout the city with its existence. During the in-store promotions that will take place in the Sharjah Coop S/M, the promotional truck will be parked outside the entrance of the supermarket so as to draw extra attention to the brand name "Olive You." Promotion will take place at four branches of the SHJ COOP stores in Riyadh with the aim of familiarizing consumers with the quality and taste of European Olives and informing them about its characteristic varieties. 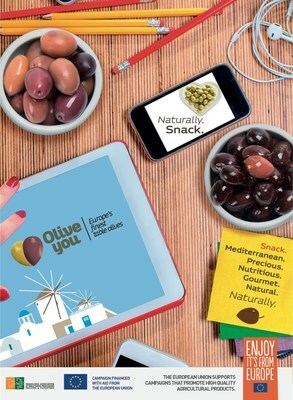 Customers will be able to enjoy Olive tastings and will be given samples. Brochures of the campaign will also be handed out to the consumers. All the promoters will be dressed in special apparel with the logo of "Olive You" and they will be standing in front of a roll-up (banner) of "Olive You." Every restaurant will showcase a special frame with the "Olive You" logo.